In celebration of Women’s Day, this March we salute yesterday & today women’s contribution to the development of the technology and IT fields. Follow #famousITwomen to find interesting stories. They might motivate and encourage you to do something out of the ordinary in your career. We’ve sat down with Franziska Sauwerwein, software craftswoman. Learn more about her professional journey and lessons learned in the IT field. She will speak at I T.A.K.E Unconference 2016. #1. What’s your professional story? Please share with us about your journey in the IT field. Hey, my name is Franziska Sauerwein and I’m a Software Craftswoman. Puzzles have always amazed me and that’s how I got interested in Computer Science. After completing my degree I worked as a software developer and consultant for three years in Germany. I then moved to London to join Codurance in the summer of 2015. My passions include Test Driven Development, Refactoring, XP techniques and high quality software development. I’m always trying to improve my skills and share knowledge. As an active member of the European Software Craftsmanship community I love to participate in unconferences and organise code retreats, hackathons, coding dojos as well as tech talks. I aim to use my skills and creativity to develop software that is reliable, easy to adapt and doing what it is supposed to do. #2. What would be a lesson you’ve learned so far as practitioners in this field? I learned that software development is much more about people than about sitting alone at a desk in a room and coding in isolation, which is great! I do enjoy coding at a high quality level but people have always fascinated me. As developers, we have a profound influence on our society and people’s everyday lives. How we write software and what we write has an impact and with great power comes great responsibility. And how people act when developing software has a great influence on how that software turns out. For example, a team that does not have a good team culture or a lacking relationship with the business will most probably have code quality problems that stem from misunderstandings and lack of communication. And sometimes products are developed just from a developer’s perspective without the user’s needs in mind when the teams are too homogenous. This is something that should definitely be changed. #3. Whom do you admire as a women IT practitioner? Why? Please share with our audience about great women you think they make a difference in this domain. There are so many women in IT that I admire. If I had to choose one, I’d point out Rachel Davies, an expert practitioner and coach of eXtreme Programming. If you search online for “Rachel Davies xp” (without quotes) you’ll find a lot of content, including videos of her inspiring talks. Talking to her has given me lots of insights and she keeps on inspiring me. What women in IT inspire you? Let us know in a comment! Curious to meet Franziska? 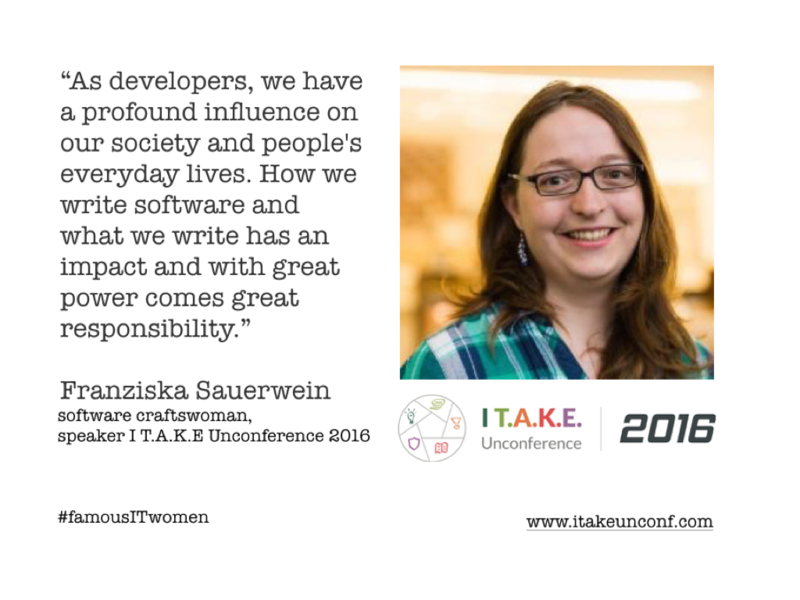 Join her @ I T.A.K.E Unconference 2016!